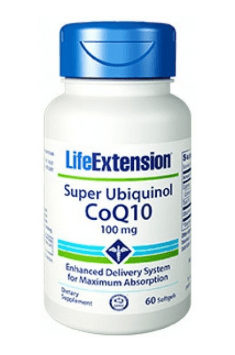 Super Ubiquinol CoQ10 by Life Extension is a coenzyme Q10 in an active reduced form, patented by the Japanese company Kaneka - the world's leading producer of natural coenzyme Q10. One serving provides as much as 100 mg of Ubiquinol. The package contains 60 soft capsules. Ubiquinol, a reduced form of coenzyme Q10, is an organic, lipophilic chemical compound that is essential to the life of every cell in the body. It occurs in the mitochondria, where it’s a component of the respiratory chain, participating in the transfer of electrons between protein complexes. The ability of coenzyme Q10 to transfer electrons determines its oxidoreductive properties and catches oxygen free radicals. Importantly, only a reduced form has the antioxidant properties – that is Ubiquinol. In addition, as shown by research, coenzyme Q10 in the form of Ubiquinol shows a much better assimilation than its oxidized form - ubiquinone. Coenzyme Q10 is one of the most important lipophilic antioxidants in the body. Ubiquinol protects the cells against excessive oxygen free radicals and xenobiotics, such as drugs, which arise from the metabolism of xenobiotics, and further supports the regeneration of the oxidized form of vitamin E to the active reduced form. Coenzyme Q10, in contrast to vitamin E, can be self-regenerated and synthesized in de novo tissues. Vitamin E also acts as an antioxidant in the lipid phase and together with coenzyme Q10 cooperates in the protection of biological membranes (especially mitochondrial membranes) against harmful peroxidation processes. The highest concentration of coenzyme Q10 is found in organs whose cells are characterized by intense energy metabolism, including in the heart, brain or kidneys. According to the study, high doses of CoQ10 can prevent cardiovascular diseases in the elderly. What's more, deficiencies of this antioxidant may affect the deteriorated functioning of all organs, the immune system and metabolic processes. As we age, we observe a lower concentration of coenzyme Q10 in the body. Even after the age of 40, the level of coenzyme Q10 may decrease by as much as 30%. This contributes to a reduction in the efficiency of supplying cells with the necessary energy, dysfunctions of tissues and organs and inadequate neutralization of harmful free radicals. In addition, an abnormal lifestyle, alcohol or taking things artificially lowering cholesterol levels intensifies this action, which is why in such cases it’s particularly worth considering supplementation. Ubiquinol can be helpful in the fight for weight loss. Studies conducted on people with elevated serum glucose and insulin parameters showed that a dose of 100 mg coenzyme Q10 in the form of Ubiquinol helps regulate glycaemic metabolism, which directly contributes to the reduction of body fat. It’s not without reason that coenzyme Q10 is called the "elixir of youth". Thanks to its antioxidant activity and a direct effect on the work of mitochondria, it has rejuvenating and delaying cell aging properties. Therefore, coenzyme Q10 is a component of many top-quality cosmetic preparations. In summary, Super Ubiquinol CoQ10 by Life Extension has a highly absorbable form of coenzyme Q10 in the right dose, which ensures the proper functioning of the mitochondria, the cardiovascular system and has the effect of reducing oxidative stress. Especially recommended for older people and athletes in the period of increased training. Despite the synergism of the coenzyme Q10 and vitamin E, these compounds show competition in absorption from the intestines. Vitamin E has been shown to inhibit the absorption of coenzyme Q10, therefore, these compounds should not be taken at the same time - the supplementation should be "separated". Extra Virgin Olive Oil, Gelatin, Glycerin, Beeswax, Purified Water, Sunflower Lecithin, Ascorbyl Palmitate, Annatto Color.